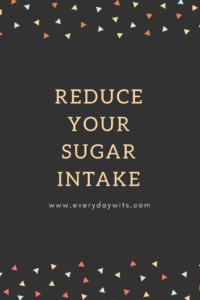 Reducing your sugar intake is possibly the most beneficial step you can take to improve your health, yielding the biggest results, in a short period of time. The first big step is to cut sugar from your drinks, this means ditching the beer, wine, soda’s, juices, cordials, hot chocolates, milk shakes, you get the point… all of it! This will make an enormous impact on the calories you consume. A typical person could easily cut out a large number of calories simply by taking this action. And with nothing else changed in your diet, even this small step will show great benefits. Both in weight loss and mood. These beverages have no nutritional value, contain no essential vitamins or minerals, they are simply there to make companies money. They contribute in sending our bodies on their way to developing type 2 diabetes, by constantly sending us on a sugar rush rollercoaster and impacting our insulin sensitivity. Unfortunately I’d also like to add store bought smoothies to this list. Many juice bar smoothies, and those found on the supermarket shelves, have a very high sugar content and not much else to offer. Yes they might have good micronutrient levels if there is a diverse range of produce in there, but our aim is to really reduce sugar. But if you are really invested in your health, make your own. Know exactly what you put in and that it’s fresh and contains no additives or preservatives. For those of you who do make them at home, remember to try adding more vegetables than fruit. Use lots of greens and 2-3 pieces of fruit. Include healthy fats to help slow the absorption of the sugars and to help the body uptake some of the fat soluble vitamins. An example of a nutrient rich smoothie would look something like this. A large handful of spinach, some cucumber, celery, 1/4 of an avocado or handful of nuts, 1/2 apple, 1/2 orange, 1 teaspoon of flax seed, use some spices such as turmeric, ginger and cinnamon. Add water, green tea or coconut water, and blend. If you want to add a protein powder you can absolutely do that. When using protein powder I prefer a milk based smoothie, so an example may look like this… 1/2 frozen banana, 1/4 c frozen berries, protein powder, 1 tsp chia seeds, 2 brazil nuts, and almond or coconut milk. Some spices for extra flavour if you’d like. So what am i supposed to drink you ask?! You can start becoming adventurous with herbal teas, they’re wonderful hot or cold. I often have a thermos sitting on my kitchen bench with a blend of herbal teas ready to pour. I also love sparkling mineral water, with a squeeze of lemon or lime in it. You can still have your coffee or tea but try not to add sugar. If you’re only likely to have 1-2 a day, then maybe you could allow yourself to add a little honey, raw sugar or coconut sugar. If you really must drink alcohol, try switching to a lower carb option as these generally contain less sugar. Or try drinking spirits with soda and lime. Be wise and limit your intake to no more than 2 a day. There is such a large array of natural sweeteners, many of which have zero or fewer calories, Stevia, Erythritol, Xylitol, and many more. Yes, these come from a natural source, some like xylitol even proving to have wonderful dental benefits, however, xylitol is known to cause tummy irritation to many. Stevia and Erythritol worry me due to their intense sweetness, you only need the tiniest amount but you may soon find yourself becoming immune to the sweetness and crave more and more. Whilst our intention is to reduce the sugar cravings! With all of these the production process is highly refined, our aim here is to be as close to the natural product as possible. There is also not enough studies on possible health impacts arising from these sugars, as they are quite new to the market. Then there are many artificial sugars, Aspartame, Saccharin, Acesulfame, Neotame and Sucralose, being the main players. I don’t believe anyone should ingest any of these, there is too much evidence showing ill health affects and that’s only the beginning, they also haven’t been around for long and in depth studies are not conclusive. Simply taking the time to read labels is an added benefit in finding hidden sugars. My general rule of thumb is to look at the per 100g and if the sugars are 5g or below I find that acceptable. This may be a challenge for some foods, such as a muesli bar, which I may then give a little leeway, up to 15g. But on general food staples, this is not acceptable. Sauces, marinades, preserves, pesto’s, all those condiment type foods are one of the worst offenders. Check the labels and learn which are better for you. Salad dressings are easy to make at home, these could be eliminated from your shopping list for good! We simply choose a vinegar, such balsamic, apple cider or white wine, add equal parts vinegar to olive oil. Season and add some herbs and you have a wonderful fresh salad dressing. There is an excellent App called Chemical Maze, which for around $10, can help you navigate all the many names under which sugar is hidden. Not to mention everything else on a food label! Many low fat food options add in lots of sugar to improve flavour. This is prominent in dairy and yoghurts. Steering clear of lower fat options will ultimately help you curb your sugar cravings. Worried about fat? Read my post on choosing healthy fats. You could also try switching your cows milk for alternatives such as almond milk or coconut milk, but watch for nasty additives. Helpful tip: When eating fruit, try to leave the skin on. This will add fibre which will help your body to absorb the sugar slower and reduce an insulin spike. Pairing healthy fats with fruit is also another way to slow down the sugar absorption. I like to eat some peanut butter with my apples and I give my kids some cheese with their fruit for snack. If you need to use sugar, which we’ve discussed should be very minimal, choose wisely. Honey, is a great first choice, it’s naturally sweeter than sugar and you’ll use less. Go find a local source and support your community knowing your’e also getting a better product. Maple syrup (not maple flavoured syrup), Organic Black strap molasses, Coconut sugar and Organic Raw sugar are also good options. Keeping in mind that we are using them minimally. Check those labels! Don’t be afraid of healthy fats!